The owner of a home-based candy business considers her next move. Forget candy hearts and chocolate. Think toffee. That’s the mantra that Marilyn Nicol wants to hear repeated this Valentine’s Day. Nicol (pronounced like the coin) owns and operates Nicol Candy out of her home kitchen in Henrico County’s West End. She’s hoping the sales of her toffee explode this time of year just as they do during Christmas. This past holiday season, Nicol made more than 500 pounds of the buttery confectionery. The tables and chairs in her dining room overflowed with dozens of gold boxes packed with toffee. “I could hardly keep up with it,” she says. For the past 24 years, Nicol’s friends and family members have counted down the days to Christmas like children in eager anticipation of Santa. The gift they are anticipating comes in a rectangular gold box tied with a fuchsia ribbon and sporting a Nicol Candy gift card. Sara Hunt, a longtime friend who plays bridge in a foursome with Nicol, says that all of her bridge partners look forward to their holiday treat. Seeing the popularity of his wife’s toffee, Nicol’s husband, Rob, encouraged her to think about starting a cottage business, selling the candy to retail establishments and also to the public. Nicol, who was working at a full-time job at the time, only toyed with the idea. Then in 1996, her husband died of a heart attack at the age of 47. On her own, Nicol began to seriously consider starting a company. A graduate of Virginia Commonwealth University with a degree in fine arts, Nicol combines her creativity and passion for art in her home and her work. Her two-story colonial house bursts with color — plums, peaches, “happy colors,” she says. Her kitchen — heart of the Nicol Candy enterprise — flows into a Florida room that floods the area with intense morning sun. Faux-painted walls are splashed with a melon color that stands in stark contrast to the room’s white columns, cabinetry and ceiling. In the kitchen window, a colorful, whimsical mobile dances in circles. Nicol has positioned a round iron-and-tile table and chairs boasting plum, brown and yellow colors in the back corner of the Florida room. She bought the set at a craft show. “I actually designed this addition around the table,” she says, pointing to the design of the tile. One segment of the kitchen — shelves and a desk — holds Nicol’s playful collection of pig statuary. Flying pigs hover over the desk. Higher up on the shelves are beloved photos of her late husband and her 16-year-old daughter, Casey. Her office — Nicole Candy central — also holds family mementos and more pigs. The room’s plum-colored walls contrast with the white ceiling. An oversized painting of a white orchid by Michael Gerry towers over the desk. In the last couple of years, Nicol has taken steps to increase the awareness of her toffee by participating in events such as Bizarre Bazaar and Daisy Days at St. Catherine’s School. That’s where she met Sharon Coleman, owner of Tinker’s, an eclectic home décor/gift boutique. Coleman is now selling Nicol Candy in her shop. “I thought it would be a seasonal item for Christmas, but people like it so much that I sell it year-round,” Coleman says. “It’s the only food item that I sell.” Coleman’s a fan herself. “I challenge anyone to find a fresher, better-tasting toffee on the market,” she says. Because it contains only four ingredients — sugar, butter, almonds and semisweet chocolate — the candy is popular with Coleman’s customers who have problems with gluten products or who have celiac disease. “This is their standard sweet because it has only four ingredients, and it keeps really well,” she says. Because she sells the candy, Nicol’s kitchen is inspected by the health department. “They have to see the recipe and how I cook it, the temperature, et cetera,” she says. Nicol is in the process of contacting more small retail stores and trying to decide whether to branch out to gift shops in Williamsburg and Northern Virginia. “I don’t want to get into the mass market because I want for the candy to be something special,” she says. Until her business grows, Nicol is working part time at Friends Association for Children, a nonprofit child-care agency, where she serves as volunteer coordinator. “I wanted to work part time while I’m building the business,” she says. 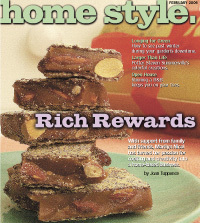 Marlyn Nicol enjoys making her sought-after toffee in her kitchen. She uses only four ingredients to make Nicol Candy.